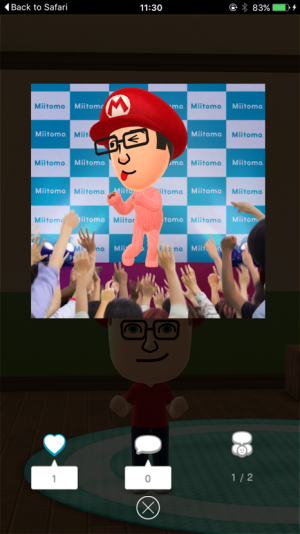 Nintendo’s first iOS app, Miitomo, has finally launched in Japan, alongside Nintendo’s new rewards program, My Nintendo. The two are, as expected, linked in a lot of ways. Playing Miitomo earns you points that you can exchange on My Nintendo for discounts on games, console themes, and other digital rewards. Among those rewards are special tickets and outfits you can use in Miitomo. Since a lot of the digital rewards are nice treats for their console and handheld players, there’s a real incentive here to play with Miitomo whether you’re interested in it specifically or not. So how is it? Well, it’s more or less as it was described to us before. You start off by creating or importing a Mii. You then assign a voice and personality to it before moving on. From there, you’ll be directed to answer your first question, which in my case was concerning my favorite food. After that, you can tinker around and do what you like. So far, that doesn’t involve much more than buying clothes, dressing up my Mii, or answering more questions. I’ve earned some Game Tickets, which I can use to play a simple pachinko-style mini-game to try and win new outfits. The other currencies include coins for buying new clothes at the shop, and a mysterious “candy" item that I can’t find a use for. Almost everything you do will earn you coins, and the game gives you a bunch up front to set up your initial outfit. Since this is a social app more than anything, you’re expected to add friends to share your answers with. You can do that face-to-face or by linking the app with your social media accounts. It’ll search automatically for any other users in your respective contact lists who are using the app and allow you to send a friend request to them. 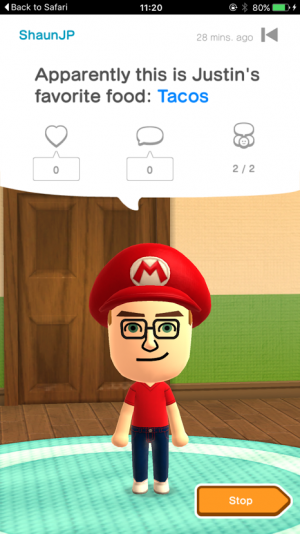 Once added, you’ll be able to talk to your Mii to found out the answers your friends gave. You can also share photos of your Mii doing various things through these accounts. As with Nintendo’s 3DS Tomodachi Collection, these pictures are often pretty goofy, so they’re kind of fun to show to people. At the moment, that’s basically all there is to it. I’ve almost earned enough points so far to pick up The Legend Of Zelda: Twilight Princess Picross for 3DS from My Nintendo, so I guess I’m pretty satisfied. As for the app itself, it’s a neat toy. We’ll have to see how it evolves to know whether it will be more than a quick novelty people use to get some free rewards, though.